This resource describes how to construct an argument using the Toulmin method, a model for argumentation developed by Stephen Toulmin in the 1950s. Developed by philosopher Stephen E. Toulmin, the Toulmin method is a style of argumentation that breaks arguments down into six copmonent parts: claim, grounds, warrant, quantifier, rebuttal, and backing. In Toulmin’s method, every argument begins with three fundamental parts: the claim, the grounds, and the warrant. A claim is the assertion that authors would like to prove to their audience. It is, in other words, the main argument. The grounds of an argument are the evidence and facts that help support the claim. Finally, the warrant, which is either implied or stated explicitly, is the assumption that links the grounds to the claim. In this example, in order to assert the claim that a dog is nearby, we provide evidence and specific facts—or the grounds—by acknowledging that we hear barking and howling. Since we know that dogs bark and howl (i.e., since we have a warrant) we can assume that a dog is nearby. Now, let’s try a more academic approach. Let’s say that you are writing a paper on how more research needs to be done on the way that computer-mediated communication influences online and offline relationships (a paper, in other words, very much like the OWL's APA Sample paper). In this case, to assert the claim that additional research needs to be made on how online communication effects relationships, the author shows how the original article needs to account for technological, demographic, and modality limitations in the study. Since we know that when a study lacks a perspective, it would be beneficial to do more research (i.e., we have a warrant), it would be safe to assume that more research should be conducted (i.e. the claim). The other three elements—backing, qualifier, and rebuttal—are not fundamental to a Toulmin argument, but may be added as necessary. 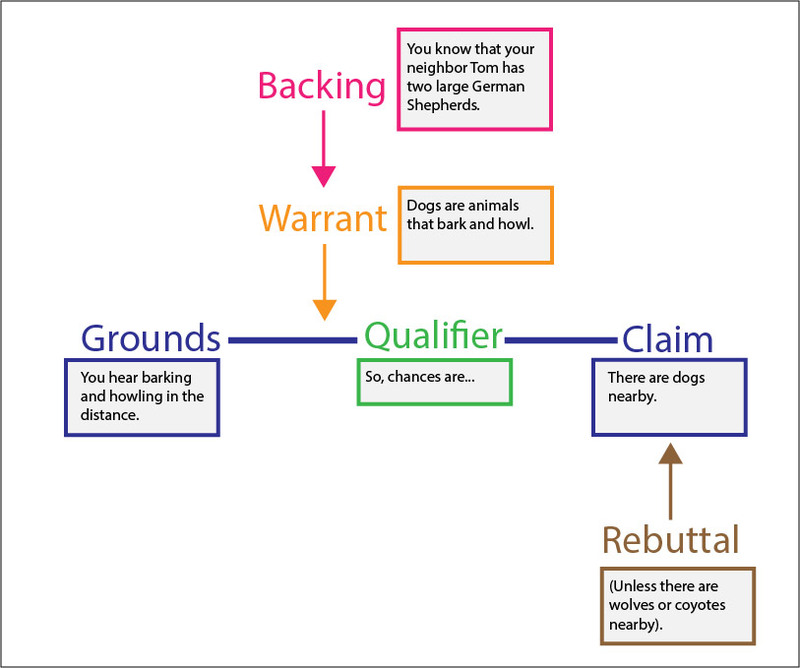 Using these elements wisely can help writers construct full, nuanced arguments. Backing refers to any additional support of the warrant. In many cases, the warrant is implied, and therefore the backing provides support for the warrant by giving a specific example that justifies the warrant. 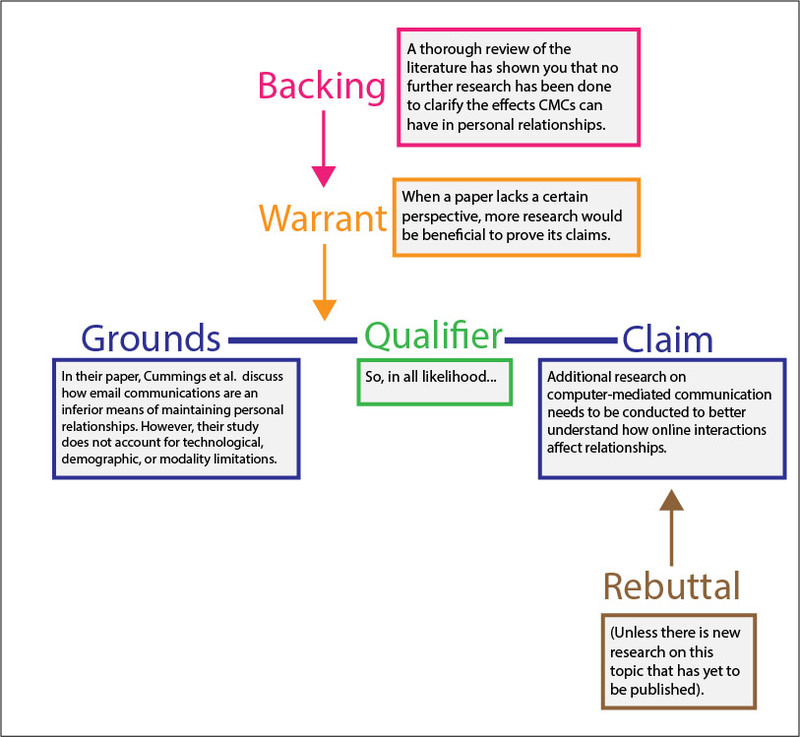 The qualifier shows that a claim may not be true in all circumstances. Words like “presumably,” “some,” and “many” help your audience understand that you know there are instances where your claim may not be correct. The rebuttal is an acknowledgement of another valid view of the situation. Including a qualifier or a rebuttal in an argument helps build your ethos, or credibility. When you acknowledge that your view isn’t always true or when you provide multiple views of a situation, you build an image of a careful, unbiased thinker, rather than of someone blindly pushing for a single interpretation of the situation. Note that, in addition to Stephen Toulmin’s Uses of Argument, students and instructors may find it useful to consult the article “Using Toulmin’s Model of Argumentation” by Joan Karbach for more information.